Laura developed an interest in the treatment and rehabilitation of injuries having experienced numerous running injuries herself. This led her to study for a Level 5 diploma in clinical sport and remedial massage therapy at the London school of sport and remedial massage. There, she learnt skills such as soft tissue release, muscle energy technique and neuromuscular technique. Laura now treats a wide range of clients from international athletes to hip replacement patients. Laura also works as a personal trainer and encourages you to take an active part in your recovery; this can include postural corrections, stretching and strengthening exercises. 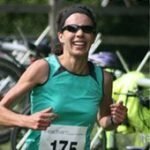 In her spare time, Laura enjoys running, cycling and swimming and competes regularly in triathlons, duathlons and running races. She has recently cycled from Lands End to John O’Groats and currently holds the world record for the fastest marathon dressed as an insect. To contact Laura Bartlett, call 01483 418103 or email us.